In this Wealthy Affiliate review I’m going to be uncovering pretty much everything there is to know about the popular online make-money opportunity Wealthy Affiliate. So if you’ve been recommended the Wealthy Affiliate opportunity by somebody then rest assured you’re in the right place to find out everything you need to know to decide whether or not it’s the right program for you. Firstly I want to talk to you about how I actually came to find the Wealthy Affiliate opportunity because I suspect that your experience is probably a similar one. I have been working online full-time now for around 5 years, and during that period of time I’ve been a member of a whole bunch of different programs & opportunities. But whenever I’m looking into joining new programs or opportunities I always go to Google & look for reviews first to make sure they’re actually legit. Anyway, what I noticed seemed to be a common trend was that a lot of these “review websites” were reviewing products and then suggesting that Wealthy Affiliate would be a better opportunity to join instead. Well, not until a couple of weeks ago at least. Yes, a couple of weeks ago I finally bit the bullet & became a member of Wealthy Affiliate myself to find out what it was all about. This time around I didn’t actually come across it from a review either, I came across it via one of their sister sites named SiteRubix (which I’ll tell you more about in a moment). 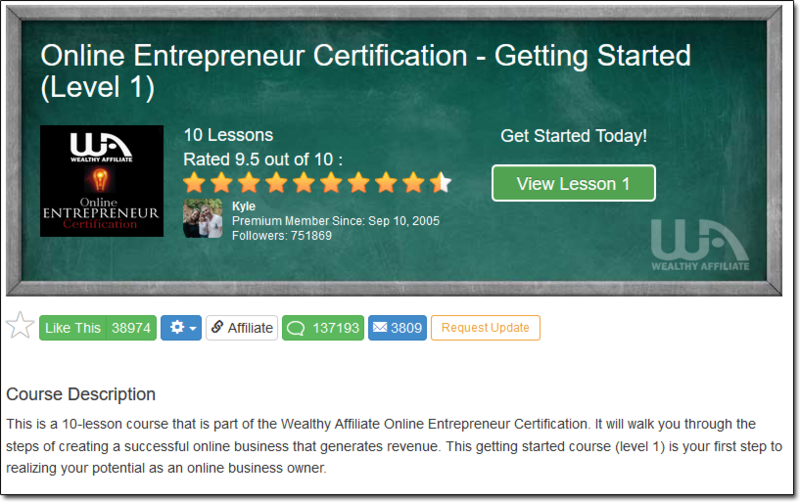 So what actually is Wealthy Affiliate? The best & easiest way to describe Wealthy Affiliate is like an “online university” that teaches people how to build a real income online (with “real” being the key word). It’s not because it’s a bad program (it’s actually REALLY cool – more on that shortly), it’s just because everything else out there is so much more shiny. You see all the other programs & opportunities that I’d been looking at were promising riches & big commissions, whereas Wealthy Affiliate does none of that. It’s not because you can’t achieve that with Wealthy Affiliate, it’s simply because they’re more honest in their approach to advertising it. But the problem is that honest does not stand out online in among all the other shiny (scammy) programs out there. This means that the “real” opportunities like Wealthy Affiliate get neglected, because people (including myself) are so much more fixated on the systems that get you all hyped up. As an example to what I mean, we all have a hunch that those “make a million in a month” programs aren’t going to actually work, but they sounds so much more exciting so we get caught up in them… And because we’re caught up chasing “silver bullet” systems, genuine programs like Wealthy Affiliate get overlooked. That phrase pretty much sums up the story of my life as an online marketer, and it’s applicable again here to Wealthy Affiliate. I mean don’t take that the wrong way – Wealthy Affiliate still works, and is still going to work well for a longgg time, but the company was founded way back in 2005 & it’s took me until 2017 to realise how great it is which equates to 12 years of missed opportunity. Doh! Just make sure you don’t make the same mistake – click here to grab your free Wealthy Affiliate account. So yeah, I’m officially now a member of Wealthy Affiliate & it’s safe to say that I’m enjoying it a lot. 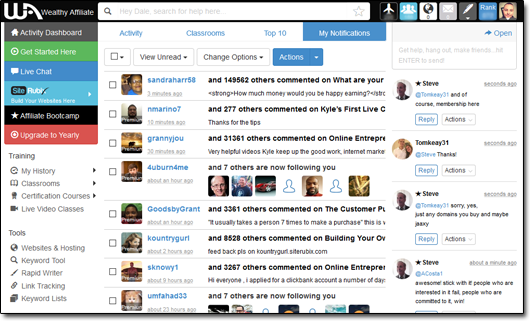 The community inside is awesome, and I love the way it’s built like a social network – it’s kind of like Facebook, but for making money online. So the first thing that’s safe to say is that unlike with other programs, at Wealthy Affiliate you’re never left to go it alone. There’s always somebody available to ask for help 24 hours a day, 7 days a week, 365 days a year (and usually they get back to you within seconds). 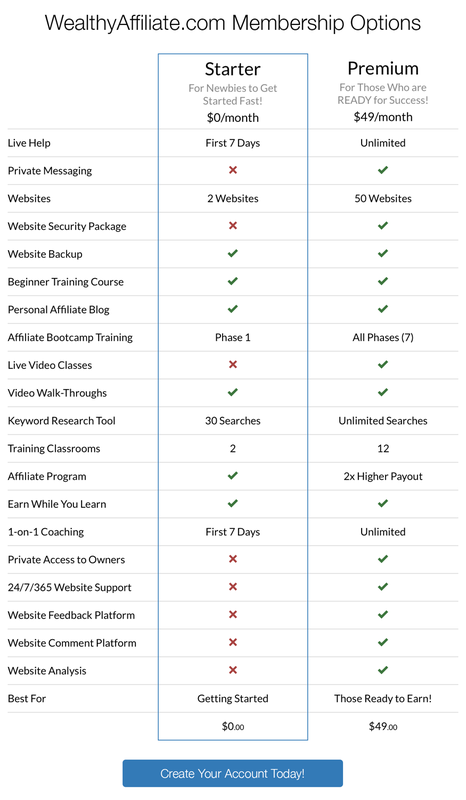 How does Wealthy Affiliate actually work? 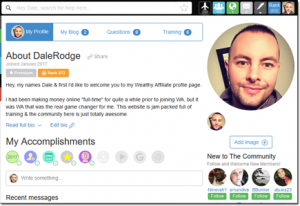 Once you join Wealthy Affiliate you’ll be asked to create a profile on their website. All you need to do is simply add a photo & write a little bit about yourself, then once you’ve done that you’re officially a member of the community & people will begin to welcome you aboard. For me that was one of the things that made me think “wow, this is actually pretty cool”… Because I seen first hand that the system was full of genuine, real people who were also all interested in learning how to build an income online. Then, once you’re in you’ll be given access to their 10 lesson training course which teaches you the foundations of making money online. Over the course of the 10 lessons you’ll learn how to set up your own website, how to get in ranked in search engines (like Google, Yahoo & Bing) and how to begin making money. It might sound pretty daunting, but the step-by-step videos make it really easy to follow. Providing you can do those 2 things – which I’m sure just about anybody can, then I’m confident you can find success with Wealthy Affiliate. It’s a case of getting out what you put in – and remember, you’ll have access to the live chat too so if you happen to have any questions along the way you can reach out to somebody & quickly get an answer. If you’ve spent any amount of time looking for ways to make money online then you’ll know that there’s a LOT of different programs & opportunities that you can join. However there’s 1 huge difference that separates Wealthy Affiliate from almost 95% of those other opportunities, and that’s the fact that at Wealthy Affiliate you are taught real skills that will enable you to generate an income online through affiliate marketing. 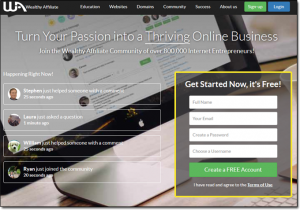 Wealthy Affiliate teaches you the skills to be able to start your own website and make money from promoting whatever it is you want to promote. For example you could make money by promoting products from the Amazon store or off eBay, or you could make money by promoting brands like Nike & Rolex. Whereas other programs are generally purely focused around just pestering people to sign up so that you can earn commissions. There’s no real training, those types of systems are just “schemes” and whilst you might make a little bit of money with them (if you’re lucky), at the end of it you’re not going to have developed any real skills. That’s the big difference between those types of systems & Wealthy Affiliate. Wealthy Affiliate is a program designed for developing long-term success. People ask this question as if there should be some sort of definitive answer, but that’s not the case. Whilst I would love to tell you that you can sign up to Wealthy Affiliate & instantly begin making $3,500 per month – business doesn’t work like that. And “business” is the key term. As a member of Wealthy Affiliate you are ultimately learning how to start your own business, and as a business owner how much you get out is determined by how much you put in. It’s not like working a job where you go to work then go home & get paid the same amount of money each month. How much or little you earn is down to one thing and one thing only… YOU. Some Wealthy Affiliate members are earning $20,000+ per month, some members are making a few hundred dollars a month, and some members are making ZERO. They all have access to the same system & they all have access to the same training… The difference in income simply depends on the action that they take. For example if you sign up & don’t do anything… You can’t expect to make money (and if you do expect to make money then you need to take a reality check). However if you sign up, follow the training & take massive action then no doubt you will see excellent results. So rather than asking how much money you can make, you need to ask how much you’re willing to put into it. As I mentioned earlier, the more you put in the more you’ll get out. You can actually join up to Wealthy Affiliate completely free of charge (yep – zero cost). There is a premium membership too which is completely optional & comes packed with additional benefits. But I want to make it clear that you can create a website with Wealthy Affiliate as a free member, and you can make money as a free member. There is absolutely no requirement for you to become a premium member to be able to make money… It’s just that as a premium you’ll get access to a whole load more benefits that will help you make more money, and that will help you make money more quickly. So do I recommend becoming a premium member? Absolutely. In fact I personally became a premium member almost instantly because I was hooked on the training and wanted more. As a free member you get a whole load of benefits, but ultimately as a premium member you get WAY more. Do you have to go premium to be able to build websites and make money? Nope. Should you go premium to get the most out of Wealthy Affiliate? Absolutely! The free membership is for people who are dipping their toes, whereas the premium membership is for people who are serious about their business and ready to really make something of it. So which membership you choose ultimately depends on what you’re trying to achieve & how much money you’re wanting to make. If you really can’t spare the cost for premium then it’s still entirely possible to make money as a free member – just that it’ll be a little harder since you won’t have access to as much training. Firstly, the whole social network layout & feel to it is AMAZING. Everybody is connected and there’s a really awesome community spirit inside. You can browse profiles, leave comments, message people and use live chat. It really is like Facebook but for making money… That’s the best way I can describe it. Their training is really easy to follow too. It’s literally step-by-step and there’s both written & video versions for each of the steps so that you can learn whichever way you feel you learn best. Plus as I mentioned above you have the live chat facility too so if ever you have any questions you can ask them & you’ll usually get a response within seconds. Wealthy Affiliate actually has 2 sister websites named SiteRubix & Jaaxy. SiteRubix is a tool that you can use create blogs with the click of a button & it makes managing them really easy. They offer an AWESOME Las Vegas incentive program. Okay so I might be slightly biased on this one because I absolutely love Las Vegas, but Wealthy Affiliate offer an amazing program whereby they offer their top performing affiliates an all inclusive trip to fly out to Las Vegas & hang out with the owners. How amazing is that! Wealthy Affiliate is without doubt an awesome program & my biggest regret is not getting involved sooner. When I started out online I was left to figure everything out by myself & that was a long, painful process. I am 100% certain that if I had came across Wealthy Affiliate when I was first starting out that I probably would have been in a much better position today. I am not saying that I am doing badly today, I am just saying that I believe Wealthy Affiliate would have massively sped up my learning curve & helped me get where I wanted to be much more quickly. So the bottom line is that if you’re looking to make a bit of extra money online or maybe even scale it up into a full-time business then Wealthy Affiliate is definitely an awesome program that will help you achieve your goals, and best of all you can try it out for FREE. Click here to get your free Wealthy Affiliate account to try it out for yourself. 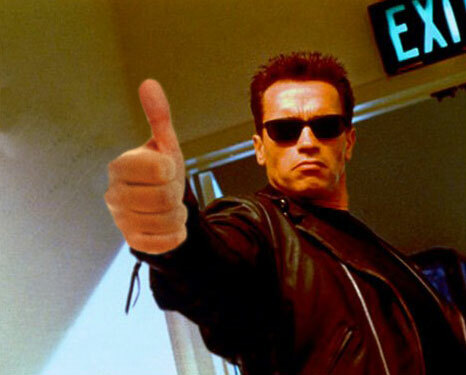 With that being said I hope you enjoyed reading my review & I hope it provided with all the information that you needed. If you still have any questions feel free to leave a comment below & I’ll be more than happy to help you out. 4 Responses to "Honest Wealthy Affiliate Review – 2019’s Hottest Money Maker"
Thanks for sharing this great review! My main concern is deciding what kind of business to grow. I do not currently have any business ideas. I guess it would make sense to promote brands, but I guess I’m just confused on how that works. Would you be able to provide more details? Thanks! Please I need the Wealthy Affiliate website to sign up.